Browsing 45 posts in prevention. Flossing your teeth can help you have healthier teeth and gums. But flossing has had a bit of a PR crisis. Hardly anyone does it. I think that it’s time to make flossing a whole lot sexier. I suggest that if you want healthier teeth and gums, you should floss naked. I’ve found that the easiest way to make something a habit is to add it to an already existing routine. For instance, if your office is on the 6th floor and you decide to take the stairs instead of the elevator. You already know you have to go to your office. So the stairs just become another part of your routine and you benefit from walking up the stairs. Well, taking a shower is already a part of most people’s routine. You get up, you make the coffee, and you jump in the shower. What if you were to add one more step to your shower routine? 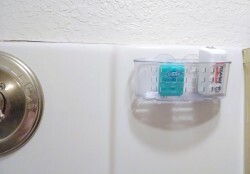 If you keep your floss in the shower, you mark that task off your list as easily as washing your hair. Plus, it has the added benefit of running water, so the disgusting part of flossing is eliminated. You can floss and then rinse your mouth right in the shower! If you’re contemplating being part of the “Floss Naked” movement, then let me offer you a couple tips. Get yourself one of those suction cup shower shelves. You can find them at most stores and pharmacies and they’re very inexpensive. I keep mine slightly higher than the shower head and a little off to the side. It’s easy to grab, but it actually doesn’t get wet. There’s nothing worse than soggy floss. These simple tips will make it easier for you to make flossing naked a habit. Try a Glide style of floss. These products are designed to be particularly slick. They slide more easily into the contact between your teeth. If you use a gentle back and forth “sawing” motion instead of “popping” the floss into the contact you can avoid a painful laceration of your gums. This can cause bleeding and actually may lead some people with healthy gums to think that their gums are bleeding due to disease. Be gentle on those gums! Make sure you pull out a longer piece than you think you need. This floss is pretty slippery so you need to wrap it around your fingers many more times than you think you should to have a firm hold. Furthermore, you’re in the shower. Your fingers are already wet. Take more than you think you need to get the job done. I promise you, I’m not paid kickbacks by Oral-B or Crest, I’ve just learned by experience. Take your time. Just like brushing, people (including myself) have a tendency to rush this process. The faster you go, the more likely you are to be rough. If you’re in a rush, just skip flossing. Don’t worry, most people never floss at all, so taking a day off now and again is no big deal. Just don’t rush it. When you’re done, place the floss somewhere easy to find and dispose of. I don’t recommend trying to wash it down the drain. Rinse your hands off and your mouth out after you’re done. 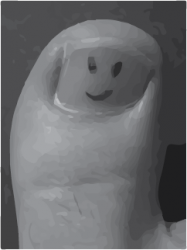 This is the best part about flossing naked. You don’t have to rinse and spit into the sink. I know this sounds weird, maybe even a little perverse. Some of my patients look at me like I’ve lost my mind after I explain how great it is to floss in the shower. But after I bug them a little bit and they try it…many admit that it made flossers out of them! Give it a try. Your teeth and gums will thank you! Did you find this post silly? Maybe a little bare? This dentist in Saginaw, MI would love to hear about it! You can share any Mead Family Dental post with a “Like” on Facebook, a “+1″ on Google+ or you can even “Tweet” it with Twitter! All you need to do is hover over the heart shaped button next to the title of the post. Or you can leave a comment by clicking on the balloon shaped icon next to the title. If you’re looking for a Saginaw dentist, we’re always happy to accept new patients! You can request an appointment online or call the office at (989) 799-9133. And, as always, you can email me at alan@meadfamilydental.com. I always answer my own emails! I’ve been reading a lot of George R. R. Martin books in the last year or so. 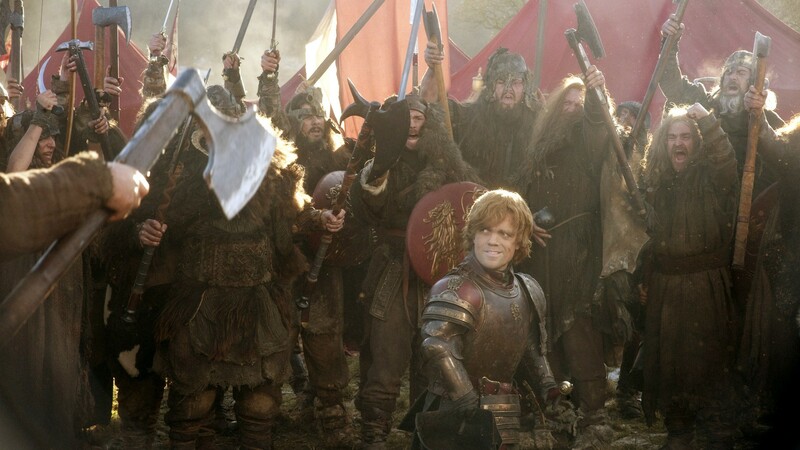 He’s the author of the series that has been made into a very popular HBO television show, “Game of Thrones.” This Saginaw dentist can’t speak for the TV show, but the book series is enthralling! The series of books is set in a middle age world of kings, knights and lords all scheming for power and status. Some of the most dramatic sequences of the book series take place during onslaughts against highly fortified castle walls. The lords can fend off most attacks in the comfort of their castle, so long as their castle walls hold up. 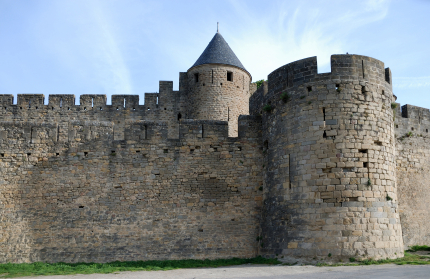 The enamel of your teeth is much like those castle walls. Many foods we eat either contain acid or are composed of nutrients that oral bacteria can convert into acid. These acids attack your teeth in the same way that Daenerys Targaryen’s dragons may some day strike at King’s Landing. The flame of the dragons’ breath will weaken the castle’s outer wall, making it more susceptible and eventually breaking holes into the wall. The outer layer of your teeth is called enamel. It serves as the outer armor of the tooth, protecting the soft, vital parts of the tooth from harm. Your enamel is incredibly strong…in fact it’s the hardest substance in the human body. It’s made up of crystals of calcium phosphate called hydroxyapatite (HA). Enamel is very durable, but it’s not indestructible. It’s crystalline structure is susceptible to acid. The acid in our mouth can actually soak into the enamel crystals and eventually break them down, which can form cavities. As long as the damage isn’t too great, you can repair these crystals by remineralizing them with calcium phosphate naturally found in saliva. What if you could magically rebuild your castle’s walls with bricks that were much stronger than the ones it was originally built from? Wouldn’t it be awesome if you could repair your enamel with something that made the already resistant crystals even stronger? Well, you can! Actually, you probably already are but you just don’t realize it. Topical fluoride found in toothpaste, mouth rinses and varnishes placed at your dental office is the magical ingredient we’re looking for. Using topical fluoride supercharges the natural process of remineralization (repair of acid attacked HA crystals). When the enamel incorporates fluoride into the HA crystals it’s actually stronger and more resistant to tooth decay than regular HA crystals. This is why most toothpastes contain fluoride and why dentists will often recommend prescription strength fluoride rinses and varnishes for patients who experience a lot of tooth decay or have reduced saliva flow. Each time you’re brushing your teeth or swishing a fluoride rinse, you should realize that you’re fortifying your defenses against the next siege! Did you find this post fortified? Did it make you want to gargle with fluoride rinse? 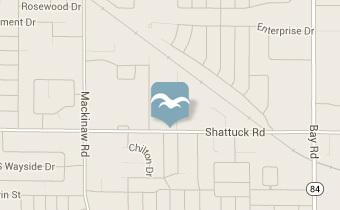 This dentist in Saginaw, MI would love to hear about it! You can share any Mead Family Dental post with a “Like” on Facebook, a “+1″ on Google+ or you can even “Tweet” it with Twitter! All you need to do is hover over the heart shaped button next to the title of the post. Or you can leave a comment by clicking on the balloon shaped icon next to the title. Click click click click click click..click…click…click…..click……click……..AHHHHHHHHH! The sudden drop, the wind racing through your hair, the speeding around the curves and some loop the loops. You’re on a thrill ride of a lifetime! If you’re a fan of roller coasters, you know exactly what I’m talking about. 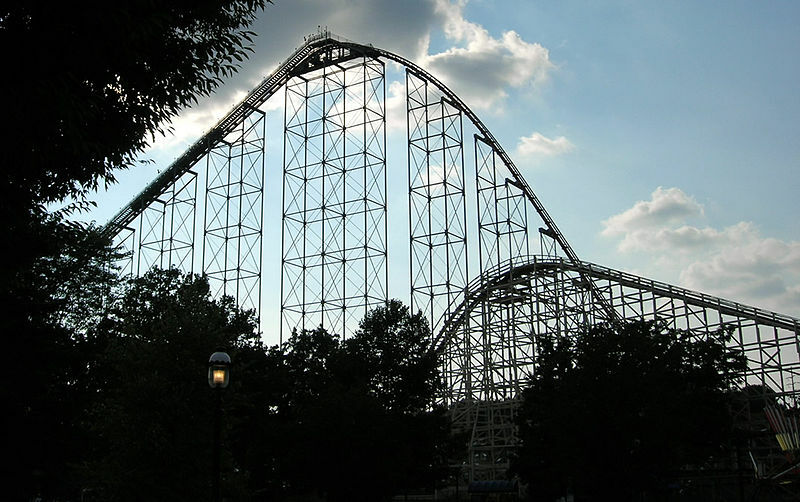 Most coaster fans really like the giant drop at the beginning more than any other part. Did you know that you have a kind of roller coaster in your mouth every single day? The pH of your mouth is constantly going up and down all throughout the day. pH is a measure of the relative acidity of an aqueous (water based) solution. In this case, it’s the moisture in your mouth. A more acid solution has a lower pH and a less acidic (alkaline) solution has a higher number. A completely neutral solution (not more acid or more alkaline) has a pH of 7. Acidic solutions are less than 7 and alkaline solutions are greater than 7. Ideally, your mouth is at a pretty neutral pH, around 7. When you consume something that the bacteria in your mouth can eat, they will metabolize this into an acid. Have you ever noticed after eating a candy bar or something else really sweet that you get a sour taste in your mouth for awhile? “Sour” is the taste that detects acidity. When you notice that sour taste in your mouth, you should realize that there has been a drop in your mouth’s pH. If the pH in your mouth drops below the critical pH (about 5.5 or so), you are at risk for tooth enamel and dentin to start dissolving! When you draw the drop in pH against time on a graph, it looks like a very steep roller coaster. Once this roller coaster drops past a pH of 5.5, your teeth are at risk for cavities! How quickly does the roller coaster rise past that critical pH again? Well, that depends. In a healthy person with normal saliva flow it’s somewhere around 25-30 minutes. Someone with xerostomia (dry mouth) might stay below this critical pH for significantly longer. Saliva has the ability to buffer the pH in your mouth. A buffer solution keeps the pH more stable and helps to restore the pH in your mouth to a neutral level. 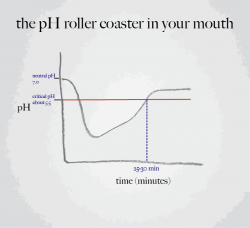 So, if you have a healthy saliva flow, you’re at less risk for cavities due to the pH roller coaster! So, let’s say you want to make this roller coaster ride a little more predictable and a lot less bumpy for your teeth. What should you do? avoid sweets and acidy foods: sweets and acidy foods (like pop) cause a steeper and deeper roller coaster drop. Whenever possible, avoid these foods. When you are going to eat or drink them, do it along with regular meals. 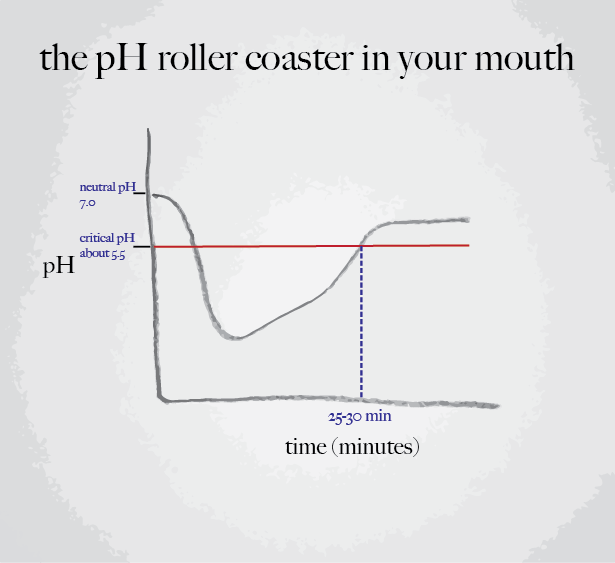 avoid lots of snacking: you jump on the pH roller coaster every time you eat or drink something. The less often you do, the less time your mouth spends below the critical pH. chew sugarless gum after meals and snacks: chewing sugarless gum will stimulate saliva flow, and saliva flow can bring a low pH back up to a safe level more quickly than without. Roller coasters in real life are a blast. The pH roller coaster that goes on in your mouth isn’t as much fun. But, you can take control with these simple rules and you’ll reduce your risk of cavities! Did you find this post thrilling? Did it make you scream out loud? I’d love to hear about it! You can share any Mead Family Dental post with a “Like” on Facebook, a “+1″ on Google+ or you can even “Tweet” it with Twitter! All you need to do is hover over the heart shaped button next to the title of the post. Or you can leave a comment by clicking on the balloon shaped icon next to the title. 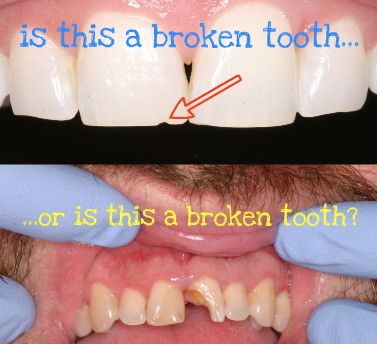 All dentists know that what a patient thinks of as “a broken tooth” can range from a tiny chip to a huge piece missing. When I saw her on the schedule I didn’t know what to expect, but I did know that she hadn’t been seen at our office for almost 5 years and she had some previous treatment recommended that hadn’t been completed. The patient told me that she had broken the tooth when she was chewing on something kind of hard. The tooth hadn’t been hurting her before it broke, but now that it was broken, it was kind of sensitive. Especially when she chewed. Then I took a look. This was a seriously broken tooth! About half of the back side of the tooth had broken off and it was broken all the way down to the gum line. I was actually a little surprised that the tooth didn’t hurt more. 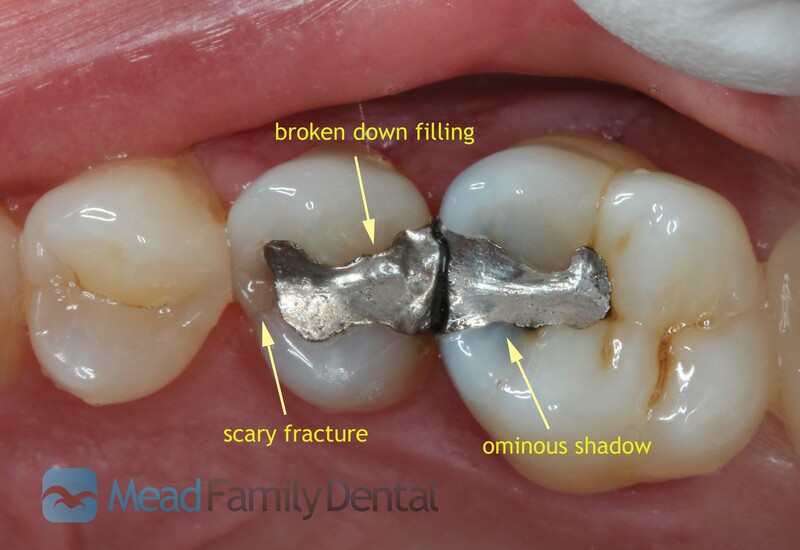 Usually when you’ve got a break this big it’s because 1) there is a large cavity that had undermined that part of the tooth or 2) the tooth had a large filling that had come out. 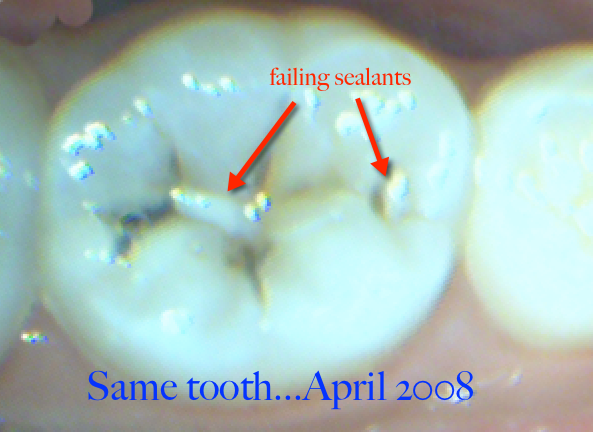 The records showed that the tooth had never had a filling before, but we had recommended cleaning out and filling the pits and fissures (aka: grooves) on the bite surface of the tooth. You’ll notice in the photo that this tooth has very darkly stained grooves. This patient is a high risk for tooth decay due to her diet and these deep grooves are a large risk factor for her as well. You’re probably thinking, “hey wait a second, doc. Almost half of that tooth is broken off. Those pits and fissures couldn’t have caused that! They’re just little tiny grooves! It must have been an olive pit or something!” I was thinking the same thing. So I decided to do a little detective work. I had a photo taken with an intraoral camera of this tooth from April 2008. It actually showed a little bit of failing pit and fissure sealant hanging in there. Even then you could see those dark grooves. This visit in 2008 was when we recommended she have those grooves cleaned out and filled. Unfortunately, that didn’t happen. The story picks back up at the beginning of February, 2013. A big piece of the tooth came off when she was eating something hard while watching the Super Bowl. It started hurting a little bit after that, and she knew she’d have to do something. The tooth did have a lot of decay, and the decay had undermined the broken part of the tooth. How do I know that? Take a look at this photo of the same tooth at a different angle. The hard, outer layer of tooth is called enamel and is much more resistant to decay than the softer, inner layer of tooth, called dentin. Grooves are weakened areas in the enamel and many grooves communicate right into the dentin. Decay causing bacteria cover the teeth, but they prefer deep, dark wet places. Places like pits and fissures. 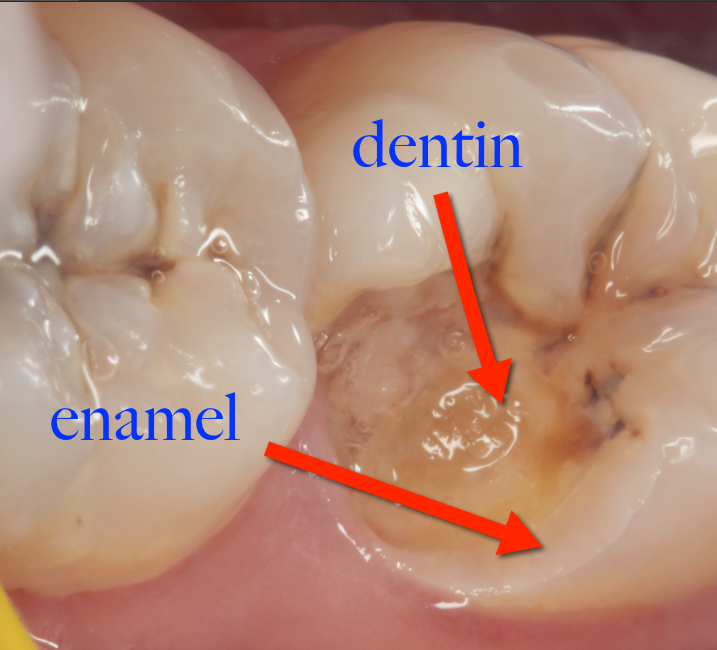 And since these grooves are actually weakened areas, the bugs and the acid they produce can slip right through the harder enamel layer and start decaying the dentin. You can actually see the path the decay took over time, right through these deep grooves into the soft, defenseless dentin. 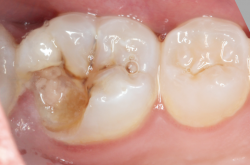 Over a period of years, this decay grew into a big cavity and undermined the enamel layer above it. Then, on Super Bowl Sunday, the patient bit onto the tooth just right, and crack! The tooth broke away leaving this soft, affected dentin layer. So that’s my groovy story. It’s kind of a sad story, because the patient is either going to need a root canal and a crown or she’s going to lose the tooth. But like all good stories, this one has a moral. The moral of this story is to have your grooves evaluated! 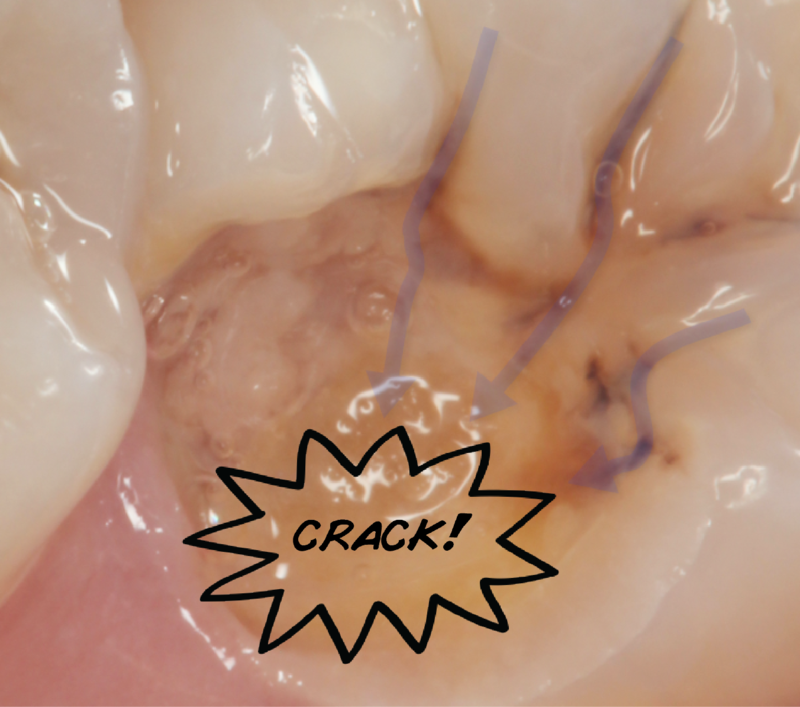 If you’ve got deep pits and fissures, you have a greater risk for this type of decay. And, left untreated, it can cause a lot of dental strife! Did you find this post groovy? Mysterious? I’d love to hear about it! You can share any Mead Family Dental post with a “Like” on Facebook, a “+1″ on Google+ or you can even “Tweet” it with Twitter! All you need to do is hover over the heart shaped button next to the title of the post. Or you can leave a comment by clicking on the balloon shaped icon next to the title. My fuel light dinged on my way to work this morning. I stopped at the station where I normally fill up and went through the routine. I actually didn’t notice the price per gallon until I was already pumping. The price was $3.34/gallon. I probably thought it was expensive back then, too. Gas is funny that way. I can’t remember a time where I ever felt like I was getting a great deal on gas. It’s probably because gas is something I need to run my car. If I don’t put gas in there, my car doesn’t run. I’d prefer not to spend a single dollar on gas. Given my choice, I’d probably spend it on a new smartphone or some nice new shoes. I’d probably go online and research online which smartphone is the best and I’d probably post some photos of my new shoes on Facebook for my friends to see. I’ve never bragged to my friends about my new tank of gas. 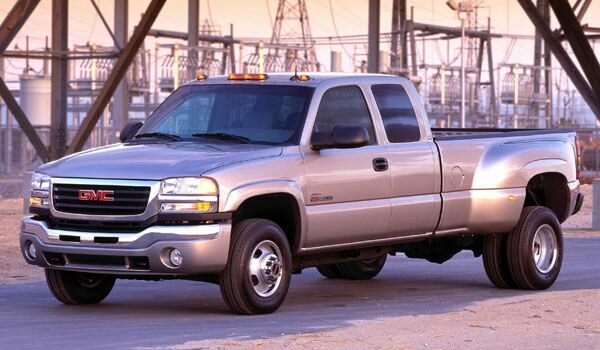 I just saved you $300, so you’re probably psyched about the sweet deal, right? Ummmm…not so much. Is there any number that the dentist throws at you that makes you think, “wow, that’s a fantastic deal on a time consuming and potentially uncomfortable procedure! I think I’ll have two?” Probably not. Let’s face it…health care is expensive. The difference is that at a dentist’s office you actually know the price of the services that you consume. At your doctor’s office or a hospital, that kind of transparency doesn’t exist. They tell you what you need, you say, “O.K.” and then they send everything to your insurance company. Then you get to play “medical bill Bingo” in a few weeks to see how much you’ll have to write a check for. Does this look like a root canal? Visit your dentist often! At least every 6 months! If you have a tooth problem, don’t wait! Call us right away…even if it doesn’t hurt! Drink pop sparingly. And when you do, consume it at meals or use the “two minute warning” technique. Ask questions about your dental condition and especially any treatment recommended by your dental team. Make sure you understand the costs of treatment before it starts! Of course you’d rather not pay for dentistry. Just like gasoline, it ends up on the needs shelf rather than the wants shelf. At least it does if you want to keep your teeth! 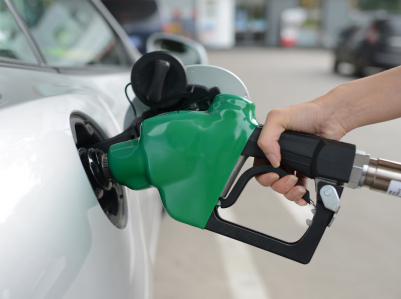 However now, every time you are waiting for your tank to fill, you’ll think of these hints to keep dental costs down. Curse you, Mead! I used to use that time for deciding what to have for lunch. Did you find this post filling? Mostly ridiculous? I’d love to hear about it! You can share any Mead Family Dental post with a “Like” on Facebook, a “+1″ on Google+ or you can even “Tweet” it with Twitter! All you need to do is hover over the heart shaped button next to the title of the post. Or you can leave a comment by clicking on the balloon shaped icon next to the title. Why take regular dental x-rays? First I would like to say, that no amount of radiation is safe..
No one has done long term studies to tell us what is happening to patients being x rayed… Every six months to a year..
We see thousands of patients coming in to hospitals with brain tumors, thyroid tumors , acoustic neuromas. I’m not implying there all related to dental x rays, I’m just using common sense. Radiation near these vital areas don’t mix..
We must change the way we view radiation!!! The reader believes that no radiation is safe. He compares radiation from nuclear blasts and meltdowns (Hiroshima and Chernobyl) to the radiation one is exposed to at the dental office. He further goes on to imply that dentists overuse x-rays and that we should only use them when a patient is having a problem. “I’m my opinion, dentist are using too much radiation and don’t care if patients get cancer or tumors. The central nervous system, thyroid, pituitary, parotid glands are extremely too close! I run into this argument often. In fact, much of radiology (medical or dental) is about taking diagnostic radiographs in patients with risk factors to “try and find something.” How about mammograms? Bone density scans? Medicine does use x-ray imaging as a diagnostic test all the time, even before “problems” arise. I recently was examining a patient during their recall appointment. My attention was focused on a restoration that had broken. The tooth right next to it didn’t appear to have any problems at first glance. It appeared innocent, but it was hiding an insidious secret. Once I reviewed the x-ray images that had been made I could see a cavity hiding in between the teeth. And it wasn’t a little one! It was pretty decent sized and needed attention, even though the patient didn’t complain of any pain or trouble! Luckily, the patient had made an appointment to deal with the broken tooth next door that very day and we were able to address this insidious hiding cavity. The reason we take dental x-rays is to help us see things that we can’t see with our eyes. Patients with low risk (e.g.–have never had a cavity, haven’t had a cavity over a period of years, good oral hygiene) don’t need them as often. 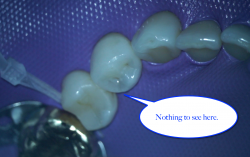 This particular patient had a lot of risk factors, including recent cavities and many previous fillings, crowns and root canals. So we take regular x-rays on her. This innocent looking tooth was hiding a whopper of a cavity! 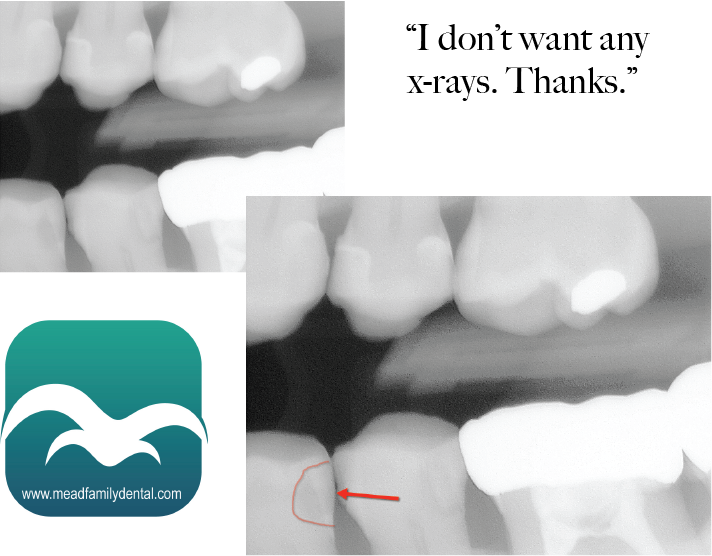 The x-rays helped me find the hidden cavity and probably spared the patient a painful toothache and root canal treatment. A small dose of x-ray radiation saved this patient a lot of trouble. Dentists don’t take x-rays for fun. We use them as tools to show us parts of your teeth that we cannot see directly with our eyes. By the way…there was a happy ending to this story! I cleaned out the decay that we found and was able to place a bonded filling in both teeth! Healthy skepticism about radiation is quite reasonable, but a small dose of radiation can yield big benefits to patients without causing harm. If you have concerns, talk to your dentist. And maybe don’t believe everything you read! Did you find this post radiant? Helpful? I’d love to hear about it! You can share any Mead Family Dental post with a “Like” on Facebook, a “+1″ on Google+ or you can even “Tweet” it with Twitter! All you need to do is hover over the heart shaped button next to the title of the post. Or you can leave a comment by clicking on the balloon shaped icon next to the title. I recently became a fan of a Tumblr called “Texts from Hillary.” This meme started with an unfortunate (but awesome!) photo of our Secretary of State wearing sunglasses and looking at her smartphone. The creators have tried to capture what Hillary might have been texting. I’m such a fan of the meme that I decided to get in on the act. Enjoy! I sit down next to my patient who has just had her teeth cleaned. The hygienist gives me a quick update of the patients health history, how the patient’s teeth and gums look and alerts me to a couple of teeth that we’ve been keeping an eye on. One tooth has a big silver filling in it with some pretty suspicious looking cracks and the tooth behind it has a pretty suspicious looking shadow around another large silver filling. I take a look at the teeth. They’re in trouble. Although I don’t have a functioning crystal ball, I can see that one tooth is at risk of breaking. 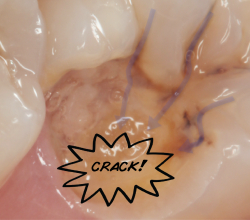 I can follow a crack down the side of the tooth and I can see some discoloration along the crack. Not a good sign. And the filling looks like it’s starting to break down at the edges. The other tooth has a small to moderate sized cavity under the filling. The hygienist and I take a photo of the offending teeth and show it to the patient on the iPad. I point out the fracture, the broken down filling and the suspicious discoloration. The patient can see my concerns. 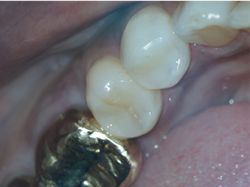 I explain my treatment recommendation: place a crown on one tooth and replace the filling in another. So, she immediately makes an appointment to have the work done, right? Well, sometimes. Sometimes it’s not enough to just describe the problem. Sometimes it’s not enough to show them the problem in living color. Sometimes, patients have objections. Assuming the patient understands the problem and understands the solution I’m proposing, there are four main objections patients typically have: time, fear, cost and trust. Time: Sometimes the patient is just too busy to do anything about it right now. It’s not that they won’t do anything, but right now isn’t good. Perhaps they have their daughter’s wedding coming up. Maybe they’ve got everyone coming to Thanksgiving dinner at their house. Often, it’s other medical issues that are just more pressing at the moment. It’s happened many times that a patient breaks a tooth a couple days before they’re scheduled to have a hip replacement or some other surgery they’ve been waiting to have for awhile. When time is the issue, it’s rarely a big problem. Fear: Some people are going to avoid dental work because they’re afraid of the process. No surprise there. A lot of adults had bad experiences at the dentist when they were younger. 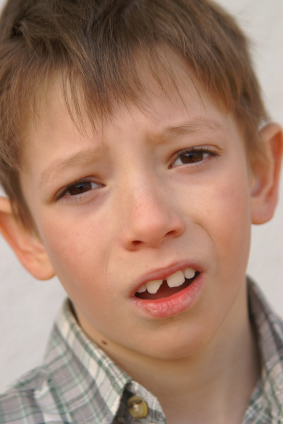 Some folks have had experienced negative stuff in the dental office as adults. It seems like everyone has a horror story of their experiences in the dental office. Technology and techniques in dentistry have come a long way over the years. We can usually keep patients comfortable through procedures and afterwards. For those that need help with their anxiety, dentistry has various pharmacological options to help keep patients relaxed throughout procedures. However, this fear is real. It keeps a lot of people out of the dentist and in pain. It takes a lot more good experiences to outweigh past bad experiences, so we go out of our way not to be the bad experience that a patient remembers for the rest of their life! If fear is your objection, we’re happy to talk to you about it and see what we can do to help control that fear. Cost: Cost is always a concern. It’s not always an objection, but no one wants to spend any more than is necessary to get a great result. Dentistry can be expensive. Especially if you’re surprised by something that you can’t plan for. That’s why we believe strongly in preventive visits. If you come in regularly and have us look things over, there’s less likely a need for the expensive stuff. And if there is need, we can plan for it so it isn’t such a financial hit. On the other hand, if there is one objection that keeps most people from getting the best dental care, it’s cost. Many people can’t or won’t spend any more than the absolute minimum on dental health. I’m frustrated by this on a daily basis. There are some pretty amazing treatments that dentistry has to offer that people don’t choose because of money. I often have to remind myself of my duty to patients, which is to diagnose their problems, explain treatment options (including the financial arrangements) and let the patient choose. 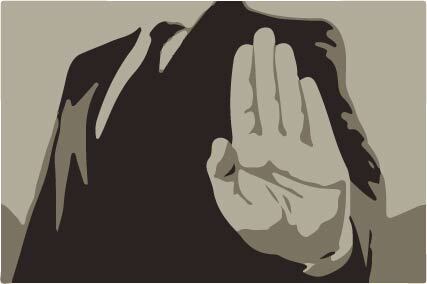 Sometimes it’s hard not to take a patient’s rejection of these awesome treatments personally. Trust: I’ve written about this on several occasions in the past. Sometimes a patient just doesn’t trust that the dentist has their best interests in mind. It’s not the timing, it’s not the fear and it’s not the cost. It’s just that they don’t believe that they need that treatment. I feel helpless as a dentist when this happens. When a patient feels that way, they probably need a change. Perhaps a second opinion or even a new dentist. If you don’t trust what your dentist is telling you, do yourself a favor and do something different. Whatever you do, don’t just keep feeling like your dentist is trying to sell you unnecessary treatment. If the relationship doesn’t work, move on. Seriously! It will be better for everyone! These are the 4 main objections I run into on a regular basis. Sometimes I’m able to help a patient move past them. Other times, not so much. I keep coming back to what my duty is. I can’t make choices for patients. What I can do is: diagnose, explain the options and allow the patient to make the right choice for themselves. I’ll keep doing my best at that! Did you find this post objectionable? Mind changing? I’d love to hear about it! You can share any Mead Family Dental post with a “Like” on Facebook, a “+1″ on Google+ or you can even “Tweet” it with Twitter! All you need to do is hover over the heart shaped button next to the title of the post. Or you can leave a comment by clicking on the balloon shaped icon next to the title. If you’re looking for a dentist in Saginaw, we’re always happy to accept new patients! Especially ones that want to punch tooth decay in the face! You can request an appointment online or call the office at (989) 799-9133. And, as always, you can email me at alan@meadfamilydental.com. I always answer my own emails! Everyone knows that tooth decay is caused by bacteria in your mouth. The bad bacteria eat the sugar that you ingest and poop out acid onto your teeth. This acid eats holes in your teeth and those holes are the cavities that dentists fix. That’s what we’re good at. Fixing cavities. We do it all day long. Does your dentist just find cavities and fix them? 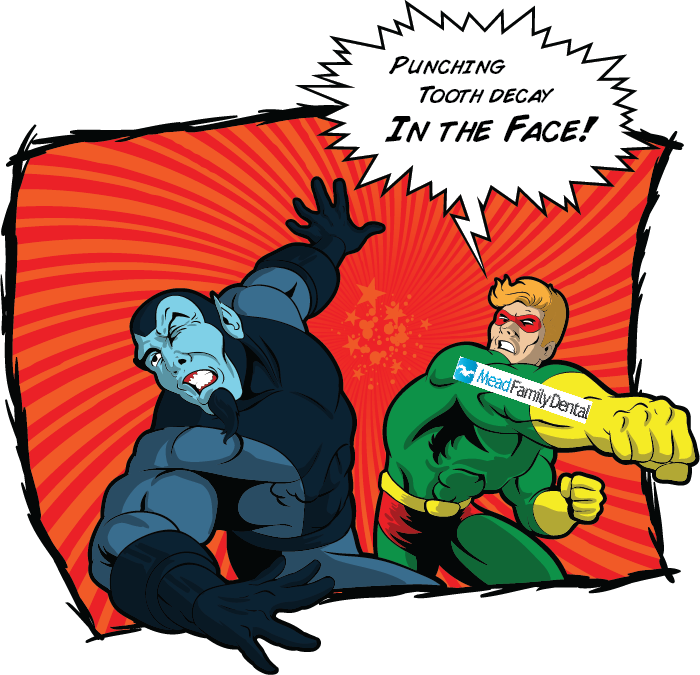 Or does your dentist punch tooth decay right in the face? I do! How do it do it? I destroy that bad bacteria and support the good bacteria. It’s almost like the bacteria are those aliens from “The Avengers” and I’m like the Hulk. Or maybe the Captain America. Yeah. Probably more like Captain America. But instead of a gamma ray enhanced strength or a shield made of vibranium, I use chemical warfare. Specifically, I use the Carifree system. 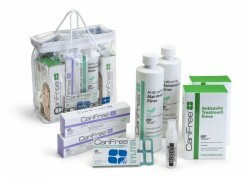 Carifree is different than any other toothpaste, mouth rinse or dental hygiene tool I’ve ever seen. 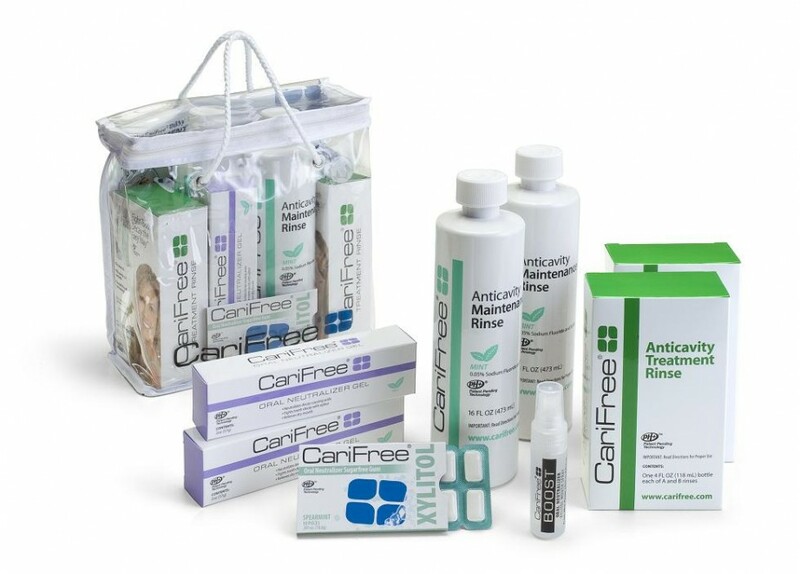 Carifree kills bad bacteria with a strong antimicrobial. But the products also treat the pH of your mouth, remineralize tooth structure that’s started to break down and even provide a source of Xylitol. All these different things contribute to a healthier, less decay-prone environment in your mouth. Removing decay and fixing cavities is called the “surgical model.” When you have a filling it’s actually a micro surgery on your tooth. Treating the bacteria and the biofilm on the surface of your teeth and gums is sometimes called the “medical model” of tooth decay treatment. When you use a system like Carifree, it’s actually medicine to treat the bacteria on the surface of your teeth that cause decay. Most dentists aren’t familiar with this “medical model” and limit their treatment to surgical interventions. By adding the the medical model to a high risk patient, we can effectively limit how much “surgery” we need to do in the future. Do you have new cavities each time you have your teeth cleaned? Are you tired of having to have cavities treated? Let us help you fix your tooth decay problem. 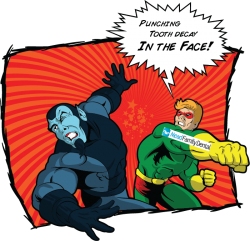 Come see us and we’ll team up to punch tooth decay in the face! Did you find this post heroic? Spine tingiling? I’d love to hear about it! You can share any Mead Family Dental post with a “Like” on Facebook, a “+1″ on Google+ or you can even “Tweet” it with Twitter! All you need to do is hover over the heart shaped button next to the title of the post. Or you can leave a comment by clicking on the balloon shaped icon next to the title. I have a friend who told me about something that happened to him recently. You’re thinking, “you expect me to believe that?” Well, kind of. I take part in similar conversations quite often. People look me right in the eye and tell me that a part of their body has broken off, but they just weren’t that worried about it. The difference is, it’s a piece of tooth and not their big toe. It isn’t normal for teeth to break. 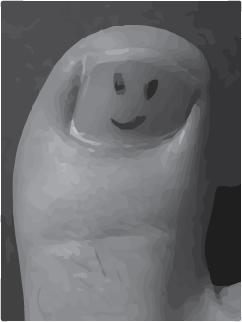 Just like it isn’t normal for your toe to fall off. If a tooth breaks, something happened. The tooth might have had a cavity. Or maybe a huge filling in it. The patient might be an untreated night time grinder and there was an undetectable crack in the tooth. Maybe there was an unusual trauma to the tooth (olive pit, anyone?) But that piece of tooth didn’t just fall off. Dentists hear that one all the time, too. No one ever comes in and says, “I was chewing on huge hunks of ice and broke my tooth.” It’s always soft bread. How the piece breaks usually isn’t that important. It’s what you do next that really counts. If you think to yourself, “well, it doesn’t hurt that much. I’ll just wait until my next appointment,” you might be looking for trouble. It’s not going to grow back. Honest. If you’ve broken or worn the outer layer of the tooth (enamel) off, the tooth becomes much more susceptible to decay. Which also means you’re much more likely to need root canal treatment or even at greater risk of losing the tooth. So if a part of your mouth breaks off, call us today. Not tomorrow. I promise you, that piece isn’t going to grow back. Did you find this post ridiculous? Eye opening? I’d love to hear about it! You can share any Mead Family Dental post with a “Like” on Facebook, a “+1″ on Google+ or you can even “Tweet” it with Twitter! All you need to do is hover over the heart shaped button next to the title of the post. Or you can leave a comment by clicking on the balloon shaped icon next to the title.